Each and every Shrub Drinks flavor makes a most refreshingly delicious thirst quencher, perfect for morning, noon or night. Make it in a glass or pitcher. It’s up to you. This is just the basics…. Here’s what we do, and each of us does it our own way, as you’ll see. Collectively, we suggest starting with a little and building the flavor till ‘just right’ for YOU! Pick a favorite Shrub Drinks flavor and grab a tall glass. Fill that tall glass with as much ice as you like. Here’s where we (C and C) differ…One of us adds the Shrub Drinks next; then tops off with still or sparkling water, club soda or seltzer. The other, adds the soda, seltzer or water first.We are happy for you to decide which technique you may prefer. In fact, we’d love to hear how you do it. Why not start off with about a Tablespoon to 16 ounces of water; let your taste buds take it from there. Mood plays a role, too. Sometimes, we like just a trickle in a glass, to make us ‘want to’ drink as much water as we really should. Other times, spicy snacks or dishes, or just a mood-swing, may make us want our Shrub Drinks punchier. We generally use a 1 part Shrub Drinks to 4 parts still or sparkling water, seltzer or soda for our sampling. How big is your pitcher? 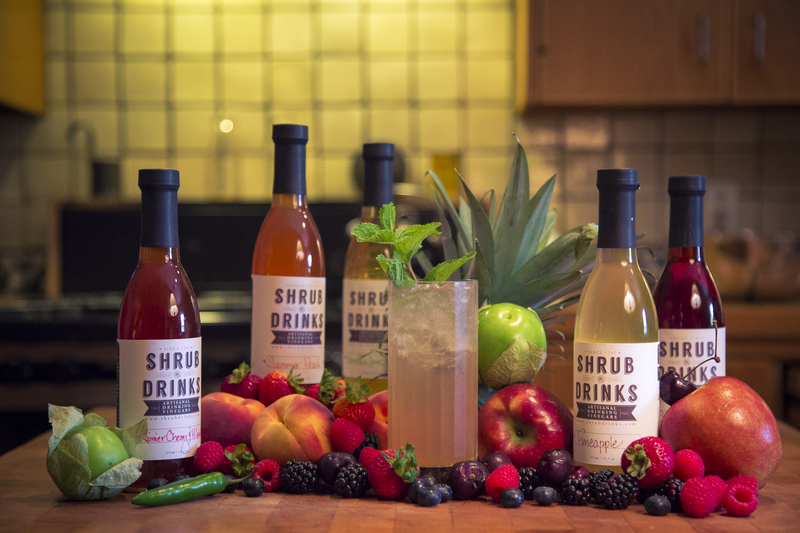 Shrub Drinks basics are just that simple! Just add your favorite Shrub Drinks shrub to your favorite sparkling wine to make a great sparkling wine cocktail. Add your favorite Shrub Drinks shrub to a glass of highly chilled Portuguese young wine, Vinho Verde. Hail Britannia! Our favorite shrubs are Very Berry, Peach and Blueberry, but we are still experimenting. Add about ½ oz of your favorite Shrub Drinks shrub and about ½ oz still water to a glass of your favorite red table wine. Turn that plain everyday wine into something really special! This entry was posted in Drink Recipes.